"Forever Young" is a song from German synthpop recording act Alphaville's 1984 debut album of the same name. The single was a strong hit in Scandinavia and in the European German-speaking countries in the same year. Though the single achieved more success in the United States than in the United Kingdom, it was not the group's highest-charting European hit. It failed to reach the American top 40 despite 3 separate US single releases, "Forever Young" became one of the signature songs of the band and it has subsequently been covered by numerous artists. 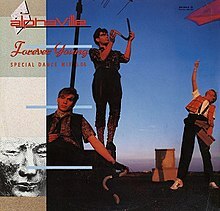 Originally released by Alphaville as a single in 1984, "Forever Young" was available in both its original mix and in a dance version, entitled the "Special Dance Mix". Over the years the band has released several remixes and demo versions of the song. The single reached number 65th position on the US Billboard Hot 100 and the top 40 on the U.S. Hot Dance Music/ Club Play Singles. The song's music video shows the band performing in one of the halls at Holloway Sanatorium in Virginia Water, Surrey, England. A number of people ranging from children to the elderly, dressed in ragged finery, awake to watch the band, then walk through a diamond-shaped glowing portal, assumingly to the hereafter. "Welcome to the Sun" also appeared (in a remix and a re-recording) on 1999's Dreamscapes. The "Special Dance Version" and the B-side "Welcome to the Sun" were both included on 2014's so80s presents Alphaville. In 2001, Alphaville released a new set of remixes in a "limited fan edition" called "Forever Young 2001". This single contained three music tracks, one spoken word track, and a PC-only track. This CD was released to fans for free, only postage needed to be paid. The names of every fan who had requested a copy were printed on the inside cover. Copies were hand-signed by the band. The remixes that appear on the single have not appeared on other releases. The cover is a still image from the video, which was created by The Cartoon Saloon. The "Thank You" track consisted of then-member Bernard Lloyd thanking the fans, while speaking over one of his "favorite tracks," which was a remix of "Lassie Come Home," as it was to appear on the 2001 remix album Forever Pop. The Magix PlayR track was a PC-only application that allowed fans to customize the FAF remix to their liking. This promotional CD was produced in a strictly limited run of 500 copies and not sold commercially. Released in 2006, this CD contains two new remixes by notable remix artist Bill Hamel. It also includes a digitally remastered version of the original album version of the song. The remix reached number 31 on the Australian ARIA Singles Chart, peaking higher than the original version in 1986, which only charted at number 47. In 2005 Australian rock band Youth Group were asked by the producers of the American television series The O.C. to record a version of "Forever Young" for use in the show, following a positive response to the use of their single "Shadowland" in a previous episode. 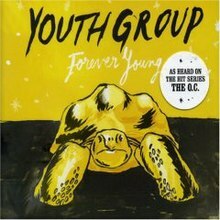 Their version of "Forever Young" was used in the show and the show's trailers, and was included on the soundtrack album Music from the OC: Mix 5. A single release in Australia reached number 1 on the ARIA Charts. The song was included on their album Casino Twilight Dogs, released later that year. Just a year after the song's initial release, pop singer Laura Branigan covered "Forever Young" on her album Hold Me and began a tradition of performing the song as an encore at her concerts. In 1991, reggae artist Wayne Wonder released a cover version that achieved some popularity in Jamaica. A recording of Wonder's version was released on the Alphaville Fan Club release History (1993). 1994, German electronic group Interactive released a cover which reached number 7 in Germany and made the top 20 in five other countries. In 2000, Czech singer Karel Gott released "Für immer jung" in German and Být stále mlád" in Czech. In 2010, Polish Symphonic Metal act Pathfinder released a cover of "Forever Young" on their album Beyond the Space, Beyond the Time, as a Japanese bonus track. In 2010, German electronic group Tangerine Dream covered "Forever Young" on their album "Under Cover - Chapter One." ^ Alphaville. "Alphaville | Music Biography, Credits and Discography". AllMusic. Retrieved 2014-05-14. ^ "Alphaville Chart History (Hot 100)". Billboard. Retrieved November 16, 2018. ^ "Gold-/Platin-Datenbank (Alphaville; 'Forever Young')" (in German). Bundesverband Musikindustrie. ^ "Italian single certifications – Alphaville – Forever Young" (in Italian). Federazione Industria Musicale Italiana. Retrieved 23 July 2018. Select "2018" in the "Anno" drop-down menu. Select "Forever Young" in the "Filtra" field. Select "Singoli online" under "Sezione". "I Die for You Today"
This page was last edited on 7 April 2019, at 10:11 (UTC).